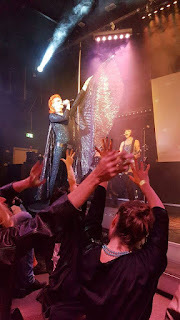 Monster Ronson's Ichiban Karaoke: LAST CHANCE for LOVING THE ALIEN, CONCHITA visits RONSON'S & THE BRUISERS' VIOLET VARIETÉ! LAST CHANCE for LOVING THE ALIEN, CONCHITA visits RONSON'S & THE BRUISERS' VIOLET VARIETÉ! Check out this photo from last week's performance of Loving the Alien! Not only was it the best show yet, but it was also the fullest! We had a line going down the block! And TOMORROW (27.7) is the LAST CHANCE to see this amazing musical!! Don't miss it, kids!! Seriously!! And speaking of not missing things - if you're missing The House of Presents on Tuesdays... DON'T! You know who didn't miss The House of Presents this past Tuesday? CONCHITA WURST! SHE was here, and told Pansy that her show is very unique and inspiring! SO BE LIKE CONCHITA AND GET YOUR BUTTS OVER HERE! And before we get to the Aussichten der aktuellen Karaokewoche, let's mention that Friuday, August 4th is the Berlin Bruisers' Violet Varieté: 5th Birthday! powered by SCRUFF. This is the 4th time that Germany's first gay rubgy team has thrown their amazing Variety show here, and it's been a total monster of a blast every time! You can find all the info about the Violet Varité HERE! So here's your weekly forecast! Cheers, monster babies! DONNERSTAG 27.7.17 ab 19 Uhr - LOVING THE ALIEN! I can't wait for the Berlin Bruisers Violet Varieté next week!! DIENSTAG 1.8.17 ab 21 Uhr - THE HOUSE OF PRESENTS!